In the late nineteenth and early twentieth centuries, wholesalers were known as “Jobbing Houses” or “Jobbers.” At first, most jobbers did not manufacture the goods they sold. Many developed lines of products under different brand names. Some items these larger jobbers later manufactured themselves, but for most they paid other firms to manufacture under the jobber’s brands. Duluth’s own Jobber’s Union formed in 1891. William R. Stone founded what would become the Stone-Ordean-Wells Company — Duluth’s first wholesale grocer — in 1872. Albert Ordean soon jumped on board, but it wasn’t until 1896 that Benjamin Wells would join them to complete the firm’s name. Three years earlier Stone and Ordean hired the well-used architectural firm of Traphagen & Fitzpatrick to design a four-story Romanesque building of brick and Port Wing brownstone at 203-211 South Fifth Avenue West. Built for $4,800, the building had a flat corner entrance and arched windows on the top floor. It could ship and receive items from railcars along tracks on one side of the facility and from ships via a dock along Minnesota slip on another. Stone-Ordean-Wells distributed mainly groceries with brand names of Nokomis, Hiawatha, Stone, Bluebird, and Express, but it also dealt with automobile tires, cigars, and wooden ware. They manufactured peanut butter and syrup, ground sugar, and at one point roasted and ground about 3.5 million pounds of coffee a year. The firm had three branch offices in North Dakota, four in Montana, and one in Minneapolis — which strictly handled tobacco products — and distributed in Michigan’s Upper Peninsula, Wisconsin, Minnesota, the Dakotas, Montana, Wyoming, and eastern Idaho. When the company closed in 1937, the building was occupied at various times by Alworth Woolen Mills, Western Electric Company, and Gershgol Food Stores, which used it as a warehouse. It was demolished in 1966 for the expansion of Interstate 35. Six years before Stone-Ordean-Wells, Moses O’Brien and Joseph Knowlton had also hired Oliver Traphagen to design its Romanesque jobbing house, the O’Brien & Knowlton Block at 126-132 West Michigan Street. The four-story building had a large central entrance and two carved stone pediments above the fourth floor arched windows. O’Brien had come to Duluth from Pennsylvania in 1870 and set up a livery service. In 1876 he became partner in the firm of Pratt & Knowlton. When Mr. Pratt died, O’Brien became full partner and the firm’s name changed. Records are unclear about what exactly O’Brien & Knowlton specialized in but it seems they made much of their income leasing the building. Over the years O’Brien & Knowlton rented space in its facility to Duluth Coffee and Spice, Kelling Produce, Siepel & Huntley Printers, August Melander Bindery, Cudahy Packing, and many others, including fellow wholesalers Hartley-Chellew. In March 1903 fire gutted one half of the building at 130-132 West Michigan Street, but it was repaired and continued to serve as a warehouse for many years. In 1961 the building was demolished for a parking ramp. 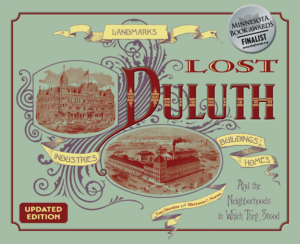 Guilford Hartley and Luther Mendenhall incorporated both Duluth Dry Goods and the Duluth Shoe Company in 1890 and had Traphagen & Fitzpatrick design a building to hold both firms at the foot of Sixth Avenue. Five stories of solid brick with arched windows on the third story, the building stood along the Sixth Avenue slip. Hartley and Mendenhall put Francis McIver in charge of Duluth Dry Goods, a clothing wholesale company, and made Robert Fitzgerald president of Duluth Shoe. The firm produced “every kind of shoe made” and Fitzgerald’s team of fourteen salesmen sold throughout Minnesota, Wisconsin, Michigan, Iowa, the Dakotas, Montana, and Nebraska. 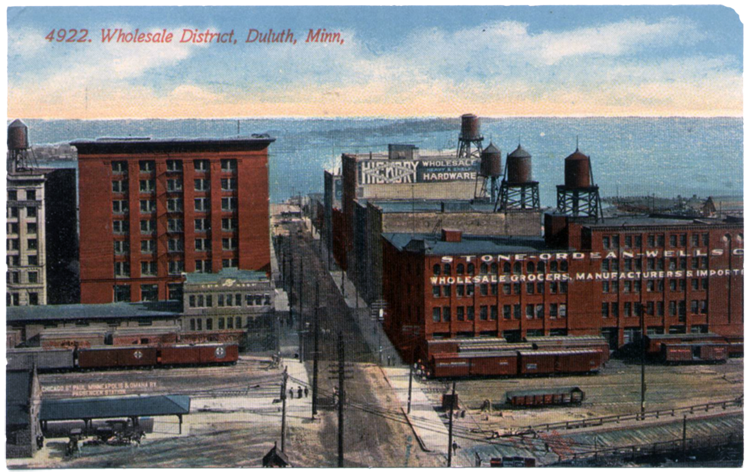 Duluth Dry Goods moved out in 1897 and Duluth Shoe planned to relocate when railroad industrialist James J. Hill purchased the building for use as a passenger and freight dock for Northern Line Steamers. Hill gave up his plans when a severe fire in December 1899 destroyed the building. Duluth Shoe became the Phillips-Bell Shoe Company in 1905. Michael Kelley, B. F. How, and A. D. Thomson pooled their resources in 1902 to form wholesaler Kelley-How-Thomson, setting up shop at 301-315 South Fifth Avenue West in a building designed by John J. Wangenstein. Kelley-How-Thomson manufactured and sold tools for mining and lumber operations and supplied local hardware stores across the northern United States. The firm established its place in the history of the National Football League by sponsoring the league’s Duluth Kelleys, the team that would become the legendary Duluth Eskimos. Its house brand “Hickory” competed directly with the “Zenith” brand of Duluth’s Marshall-Wells. Apparently Zenith won, because in 1955 Kelly-How-Thomson became Marshall-Wells’ subsidiary, operating under its own name until both companies closed in 1958. The buildings on South Fifth Avenue were used as warehouses until they were demolished in 1968 to make room for the Interstate 35 expansion. In 1893 Albert Morley Marshall purchased Duluth’s Chapin-Wells wholesale hardware business — first established in 1886 as G. C. Greenwood & Company — at 406 West Superior Street and renamed it Marshall-Wells. His business prospered, and soon he was shipping throughout the Midwest and Canada. Marshall-Wells developed a product line of tools and other goods manufactured by others and rebranded under the Zenith label before they were shipped out. Marshall-Wells got in on the manufacturing end as well, making paint and appliances in Duluth. Business was going so well that in 1900 Marshall built a seven-story office, plant, and warehouse at 325 South Lake Avenue. The building was designed in two sections and straddled railway tracks. A year later Marshall-Wells opened branches in Canada and the Pacific Northwest; nine years after that it became the largest hardware wholesaler in the United States, the third largest in the world. Marshall-Wells grew to operate over one thousand retail stores in the United States and Canada and reached annual sales of $100 million. By 1950, sales dropped dramatically, and in 1958 the company liquidated. While Marshall-Wells is gone, its building has not been lost. Today the complex, known as the Meierhoff Building, has been divided into a hotel, restaurants, and offices. Another building constructed as a jobbing house that remains in Duluth is the Gowan-Lenning-Brown Building, which went up at 525 South Lake Avenue in 1915. Designed by Frederick German, the building sits adjacent to Duluth’s Aerial Bridge and was built as a grocery manufacturing and wholesale warehouse. Gowan-Lenning-Brown was considered Duluth’s premier wholesale grocery at the time. Today it is the Paulucci Building. In 1906 the company moved to a new building on Commerce Street, and six years later the firm became Northern Drug, which survived until 1997. The Fifth Avenue structure was renamed the Sweatt Building, eventually becoming part of the Kelly-How-Thomson Hardware wholesale complex. In 1966 the building — along with many of the wholesale buildings along South Fifth Avenue West — was demolished for the expansion of Interstate 35. Cameron A. Rust arrived in Duluth in 1892 and joined the Wells-Stone Mercantile as a bookkeeper. He was eventually promoted to treasurer and general manager of Stone-Ordean-Wells. In 1910 he teamed up with Frank E. Parker, two of his brothers, and H. R. Ketchum and left Stone-Ordean-Wells to start Rust-Parker-Martin. That same year they retained the services of William Hunt to design them a five-story brick building at 217 South Lake Avenue, with railroad tracks running through the building’s lower level. The business was later renamed Rust-Parker Wholesale Grocery Company. Rust-Parker manufactured and/or packed spices, jams, jellies, syrups, vinegar, fish products, and roasted coffee under the Table Talk and Home Brand labels. Rust was struck with a heart attack at Northland Country Club in September 1916. According to historian Rachel Martin, the forty-eight-year-old businessman “left the links complaining of chest pain, and died in the locker room.” Rust-Parker went on without him, and by 1922 it was one of the largest wholesale concerns in the region. But by the end of World War II its business had waned, and in 1947 Rust-Parker was liquidated. Other wholesale grocers occupied the building until 1980. The plant, which was then called the Viking Building, was demolished in December 1982 for the expansion of Interstate 35. In 1922 A. Miller MacDougall, son of Captain Alexander MacDougall, began building a six-story warehouse at 824 Railroad Street, the foot of Ninth Avenue West. He named it the MacDougall Terminal for his father and backed his effort by bringing Marshall W. Alworth on as the concern’s vice-president. Railroad tracks allowed trains to load and deliver food directly inside the building, which was constructed of reinforced concrete faced in brick with terra cotta trim. Designed as a cold-storage warehouse by S. Scott Joy — the primary architect of Chicago’s Manufacturing District — the MacDougall Terminal was first served by two boats, package freighters with a 2,300-ton capacity built by the Minnesota-Atlantic Transit Co. Business soon took off. Minnesota-Atlantic then purchased five small steel-hulled ships constructed for emergency salt water service in World War I. They nicknamed the newly acquired ships the “Poker Fleet,” after a poker game inspired company executives to re-christen the boats — which had been named for lakes — after the highest five cards in a poker hand: Ace, King, Queen, Jack, and Ten. Each was refitted with refrigeration units to pack perishable food shipped to and from Duluth and New York. The Poker Fleet became the largest such operation in the world at the time. Success, however, was short-lived. By 1930 the business was placed in receivership. A group of Duluth businessman purchased the building and renamed it the Duluth Terminal. In the 1970s it was purchased by Jeno Paulucci and used to manufacture his Jeno’s brand frozen pizzas. Jeno’s left the building in 1983. It was demolished in 1987; the property remains vacant.